Houston (January 21, 2019) – A five-car collision left two people dead and two others are facing DWI charges. 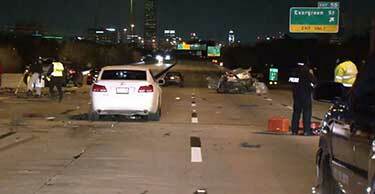 The multi-car accident occurred Sunday at 2:00 a.m. near West Loop and Beechnut exit. The driver of a white Lexus hit another car and was stalled on the highway. The driver sat on the side of the road making phone calls. Next, a black Ford F-150 tried to avoid the wreck but collided with a Ford Taurus and killed both people inside. The driver of the Lexus and F-150 were both charged with drunk driving. Prosecutors are still evaluating whether the pick-up driver’s alleged intoxication would have caused the second car accident or played a role in the double fatality. Authorities have not released the names of the victims or the drivers charged.